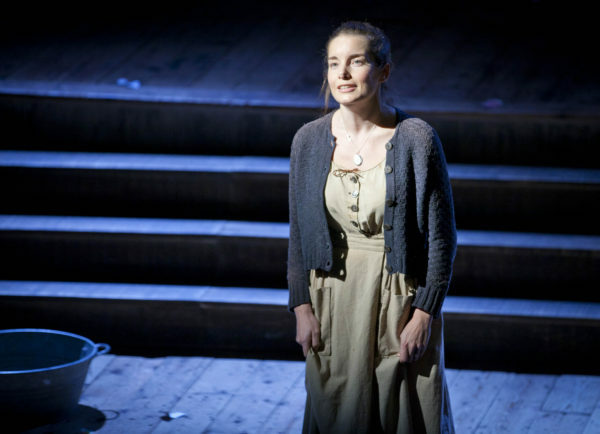 Rebecca Trehearn in Floyd Collins at Wilton’s Music Hall. Photo: Hannah Barton. The journeys we take in life don’t always go to plan. A case in point would be the way that one moment you’re enjoying a leisurely evening stroll around the Tower of London, admiring the light reflecting off the river. And the next you’re noticing the time; noticing the surprising length of major London roads and running – yes, literally – running towards Wilton’s Music Hall, only to arrive with four minutes in hand to take a seat as the smelliest critic in London. Of course, it wasn’t always like this. There was a time when being a journalist meant presenting a front to the world that contained a little class. A little panache, even. Floyd Collins: The Musical knows a thing or two about this good old timely journalist type. The production is littered with handsome hacks in trilbies and brown pinstripes, who are always rushing off to file a last minute report down the phone lines to the Tribune, Picayune or Bunyip. The journos’ group ditty about getting the scoop (on the poop) at the start of the second half is in fact one of the highlights of an otherwise both meandering and harried musical. Unlike the sharp-suited slickness of the press gang, the rest of the show feels lacking in that last bit of finesse that would make it hang together like a dapper three-piece suit. There are moments of style, not least in the set design (not credited to anyone in the programme). Illuminated by Rick Fisher’s lighting design so as to mute the fading antique paint work that can still be seen on the walls of Wilton’s, the delicately dishabille music hall makes an almost perfect setting for a theatrical cave. Even the twisting wooden columns like giant pieces of fusilli neatly reference huge drill heads that could be used to split open the earth. There are also elements of Floyd Collins which are deliberately varied. The music and lyrics by Adam Guettel place Bluegrass alongside pieces inspired by the American greats of Copland and Gershwin. There’s even a little bit of Stravinsky thrown in for good measure. The folksy country-infused pieces arguably work much better, as they place the story within a tradition of long and winding ballads telling tragic tales. I imagine Dylan or the Dixie Chicks could produce a good eight-minute song about Floyd Collins the cave explorer. An opening scene in which Rebecca Trehearn as Nellie Collins spins around to sit more comfortably and listen to Francesco Lo Giudice as Jewell Estes singing to an acoustic guitar, reinforces this sense of gathering around the fire to hear stories you would never believe. Which brings us to one of the essential sticking points of the musical as something originally created by Tina Landau and Guettel. Being based on true events, the story of Floyd Collins stuck down a mine isn’t a charming yarn the audience can choose or not choose to believe. On a basic level, the fact you can easily find out Floyd’s story in advance, therefore basically knowing the conclusion before the start of the production, perhaps diminishes engagement with a narrative whose main event (the explorer becoming trapped) takes place in the very early stages. However, there are countless incidences where as an audience you already know the end of the play – either because it’s based on true events or because you simply know the plot having read it or seen it previously – so being able to Wiki the real Mr Collins in advance shouldn’t be a major problem. Instead what is more distracting is just this knowledge that this really was the fate of one man, who died in pretty horrible circumstances. The musical itself criticises the ‘circus’ that arrives in town to follow Floyd’s rescue effort. The snazzy suited hacks are a part of this, being depicted as more interested in presenting a saleable story than showing compassion for the human slowly dying underground. However, watching this musical at times makes you wonder if you too are now contributing to the continued shiny packaging and re-selling of a tragedy. End of life scenes where the man communes with God and imagines being set free by his family members who are dressed in white like angels, become particularly disconcerting to watch when placed in this context. Despite these hesitations, this production of Floyd Collins does – like even the worst of journeys – contain moments of beauty. These are provided by the effortlessly gorgeous vocals of Trehearn (previously in Daniel Evans’ Show Boat). Her performance in general as the perennially positive, but also very complex, sister recently returned from an asylum often makes her the most intriguing character on stage. Her solo songs stand out as singularly special sections of the musical. Hearing her is well-worth breaking a sweat for. Floyd Collins is on at Wilton’s Music Hall until 15th October 2016. Click here for more details.